This post comes from Stephane Combaudon at the MySQL Performance Blog. The main benefit of using GTIDs is to have much easier failover than with file-based replication. We will see how to change the replication topology when using GTID-based replication. That will show where GTIDs shine and where improvements are expected. This is the second post of a series of articles focused on MySQL 5.6 GTIDs. You can find part one here. For these tests, all servers are running on 127.0.0.1 with ports ranging from 10000 for s0 to 10004 for s4. 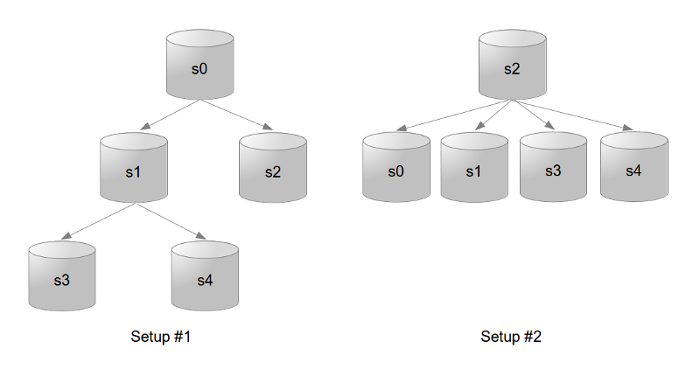 This is the easiest case, we will make s2 a master and redirect replication on the other servers to s2. This scenario can happen when you want to perform a planned failover. Those of you who have already done these operations with file-based replication know that it is usually very tedious and that proper recording of binlog file/binlog position needs to be done with care if you don’t want to break replication or corrupt your data. Now let’s imagine that s0 has crashed, and that s1 has not received all writes (and therefore s3 and s4 are also lagging behind). Can we still use master_auto_position = 1? Let’s hope so, as it is one of the ideas of GTIDs: having for each event across the cluster a monotonically incremental identifier for each event. Notice that this is the same problem for s0 (which will be late when it comes back) and s1, s3 and s4. Great! So again, using GTIDs avoids the tedious work of looking for the binlog position of a specific event. The only part were we should pay attention is the server we choose for promotion: if it is not up-to-date, data may be lost or replication may be broken. If the binary logs of the master are no longer readable, you will probably lose the events that have not been sent to the slaves (your last chance is to be able to recover data from the crashed master, but that’s another story). In this case, you will have to promote the most up-to-date slave and reconfigure the other slaves as we did above. So we will suppose that we can read the binary logs of the crashed master. The first thing to do after choosing which slave will be the new master is to recover the missing events with mysqlbinlog. We can see that it’s not obvious to know which was the last executed event: is it 219be3a9-c3ae-11e2-b985-0800272864ba:1 or 3d3871d1-c3ae-11e2-b986-0800272864ba:4 ? A ‘Last_Executed_GTID’ column would have been useful. In our case we can check that 3ec18c45-c3ae-11e2-b986-0800272864ba is the server UUID of s2, and that the other one is from s0 (for s0 which is crashed, the server UUID can be read in the auto.cnf file in the datadir). So the last executed event is 219be3a9-c3ae-11e2-b985-0800272864ba:1. How can I instruct mysqlbinlog to start reading from there? Unfortunately, there is no --start-gtid-position option or equivalent. See bug #68566. Does it mean that we cannot easily recover the data with mysqlbinlog? There is a solution of course, but very poor in my opinion: look for the binlog file/position of the last executed event and use mysqlbinlog with the good old --start-position option! Even with GTIDs, you cannot totally forget old-style replication positioning. Reconfiguring replication when using GTIDs is usually straightforward: just connect the slave to the correct master with master_auto_position = 1. This can even be made easier with mysqlfailover from the MySQL Utilities (this will be the topic of a future post). Unfortunately, this will not work for every use case, and until this is fixed, it is good to be aware of the current limitations.